In the current issue of the online Journal of the World Public Health Nutrition Association (of which I am a charter member), Carlos Monteiro, a professor at the University of São Paulo writes “The big issue is ultra-processing.” Because his Commentary is so lengthy, I am taking the liberty of extracting pieces from it, not always in the order presented. The most important factor now, when considering food, nutrition and public health, is not nutrients, and is not foods, so much as what is done to foodstuffs and the nutrients originally contained in them, before they are purchased and consumed. That is to say, the big issue is food processing – or, to be more precise, the nature, extent and purpose of processing, and what happens to food and to us as a result of processing. Type 1: Unprocessed or minimally processed foods that do not change the nutritional properties of the food. Type 2: Processed culinary or food industry ingredients such as oils, fats, sugar and sweeteners, flours, starches, and salt. These are depleted of nutrients and provide little beyond calories (except for salt, which has no calories). Type 3: Ultra-processed products that combine Type 2 ingredients (and, rarely, traces of Type 1). durable, accessible, convenient, attractive, ready-to-eat or ready-to-heat products. Such ultra-processed products are formulated to reduce microbial deterioration (‘long shelf life’), to be transportable for long distances, to be extremely palatable (‘high organoleptic quality’) and often to be habit-forming. Typically they are designed to be consumed anywhere – in fast-food establishments, at home in place of domestically prepared and cooked food, and while watching television, at a desk or elsewhere at work, in the street, and while driving. Much more energy-dense than unprocessed and minimally processed foods and processed culinary ingredients taken together. [Contain] oils, solid fats, sugars, salt, flours, starches [that] make them excessive in total fat, saturated or trans-fats, sugar and sodium, and short of micronutrients and other bioactive compounds, and of dietary fiber. Relatively or even absolutely cheaper to manufacture, and sometimes – not always – relatively cheaper to buy. Often manufactured in increasingly supersized packages and portions at discounted prices with no loss to the manufacturer. Available in ‘convenience’ stores and other outlets often open late or even 24/7, and vended in machines placed in streets, gas stations, hospitals, schools and many other locations. The main business of transnational and big national catering chains, whose outlets are also often open until late at night, and whose products are designed to be consumed also in the street, while working or driving, or watching television. Promoted by lightly regulated or practically unregulated advertising that identifies fast and convenience food, soft drinks and other ultra-processed products as a necessary and integral part of the good life, and even, when the products are ‘fortified’ with micronutrients, as essential to the growth, health and well-being of children. Diets mainly made up from combinations of processed ingredients and unprocessed and minimally processed foods, are superior to diets including substantial amounts of ultra-processed products. Almost all types of ultra-processed product, including those advertised as ‘light’, ‘premium’, supplemented, ‘fortified’, or healthy in other ways, are intrinsically unhealthy. Significant improvement and maintenance of public health always requires the use of law. The swamping of food systems by ultra-processed products can be controlled and prevented only by statutory regulation. This editorial is about the significance of food processing, and in particular of ‘ultra-processed’ food and drink products. It is also about the nature, purpose, scope and value of nutrition science, which as conventionally taught and practiced, is now widely perceived to have run into the buffers or, to change metaphor, to have painted itself into a corner. The editorial argues that nutritionists’ focus on nutrients, rather than foods, has led to the assumption that if foods contain the same nutrients, they are the same—even though it is never possible to replicate the nutritional content of foods because too much about their chemical composition is still unknown. These are important ideas, well worth consideration and debate. I am struck by their relevance to the latest survey of soft drink availability in American elementary schools. Despite the efforts of the Clinton Foundation and the voluntary actions of Coca-Cola and Pepsi-Cola, the availability of soft drinks to young school children increased from 49.% to 61% just in the year from 2006-07 to 2008-09. Soft drinks, in Monteiro’s terms, are ultra-processed. Doing something about them requires statutory regulation. 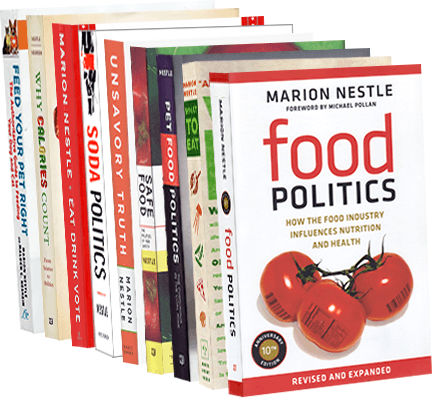 Addition: I should have mentioned that Monteiro’s approach is consistent with that of the people (including me) who worked with the Strategic Alliance in Oakland, CA to write Setting the Record Straight: Nutritionists and Health Professionals ” Define Healthful Food. The Alliance is California’s network of food and activity advocates, we’ve developed a definition of healthy food that asserts that truly healthful food comes from a food system where food is produced, processed, transported, and marketed in ways that are environmentally sound, sustainable, and just. If you agree with Setting the Record Straight, you can endorse it on the Strategic Alliance’s website.